Escrow accounts provide for the timely payment of taxes and insurance on your home. This prevents tax liens, loss of property and any lapse of insurance coverage. As part of your regular mortgage payment, 1/12th of the annual cost is collected. These funds are held and paid out as bills come due. 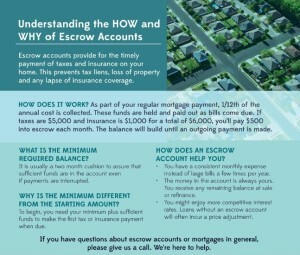 If taxes are $2500 and insurance is $1,000 for a total of $3,500, you’ll pay $291.66 into escrow each month. The balance will build until an outgoing payment is made. The minimum required balance is usually a two-month cushion to assure that sufficient funds are in the account even if payments are interrupted. The minimum is different from the starting amount to make sure sufficient funds are available to make the first tax or insurance payment when due. 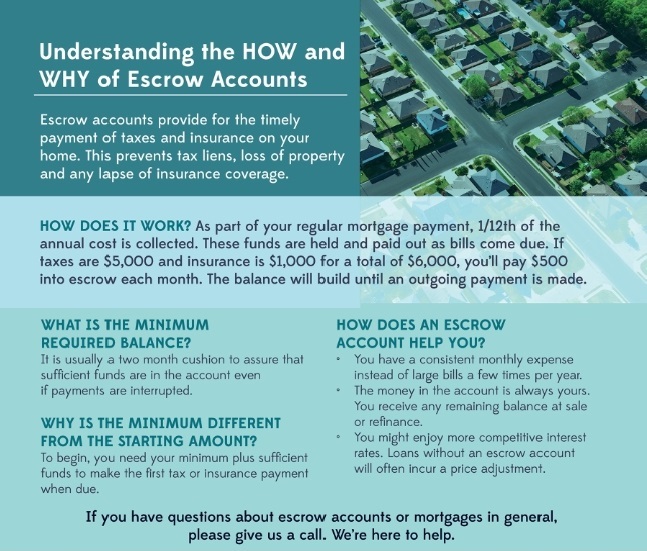 So how does an escrow account help you? You have a consistent monthly expense instead of large bills a few times per year. The money in the account is always yours. You receive any remaining balance on the sale or refinance. You might enjoy more competitive interest rates. Loans without an escrow account will often incur a price adjustment. If you have questions about escrow accounts or mortgages, in general, please give us a call. We’re here to help.